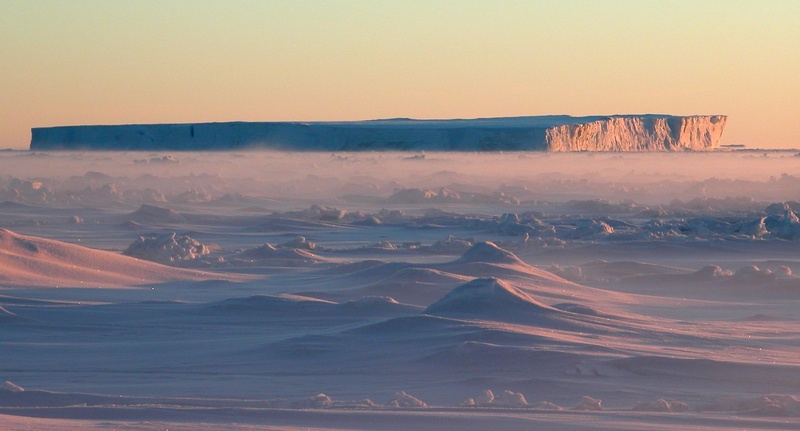 What happens next when the size of a country Antarctic iceberg breaks away? You never forget the first time you see an iceberg. The horizon of a ship at sea is a two dimensional space and to see a three dimensional piece of ice appear in the ocean is quite something. But, in truth, the first iceberg you see is likely to be small. Most icebergs that make it far enough north from Antarctica to where they are danger to shipping are sometimes many years old and at the end of their lives. They are small fragments of what once left the continent. Once in a while, however, a monster breaks free from the edge of Antarctica and drifts away. Tens of kilometres long these bergs can tower perhaps 100 metres above the sea and reach several hundred more below the surface. These are called tabular icebergs – and while it is rare for humans to see something on such a scale they are part of the normal cycle of glacial ice in Antarctica. A tabular iceberg gets stuck in thin, seasonal sea ice. Everyone knows Antarctica is an ice-covered continent, but the ice is not static. To a scientist it is a dynamic environment – it’s just a question of the timescale you are looking at. Snow falls on the continent and over time it has built up layers of ice which flow in glaciers towards the coast. On reaching the sea, these glaciers fracture and release icebergs or form large regions of floating ice known as ice shelves. In a few special places glaciers can extend tens of kilometres into the ocean – giant fingers of ice several hundred metres thick, pointing out into the sea. Just like a wall they shield what is in their lee, and rather than the ocean being covered by drifting sea ice it can remain open throughout the year to form what is called a polynya. The ocean still freezes, but the ice is constantly pushed away by the prevailing winds. Open water throughout winter helps seals and penguins survive, and stimulates phytoplankton production. A new research article in the journal Nature Communications by a French team working in Antarctica has looked at the history of the polynya in the lee of the Mertz Glacier going back 250 years. This glacier forms one of these fingers of ice reaching out from the continent and the polynya in its lee can be up to 6,000 square kilometres. The glacier tongue (blue) in summer and winter. The polynya is shaded yellow. What they did was take a core sample of sediment from the sea bed in the lee region (the red star in the above images) and look back in time using climate proxies such as the titanium content – which can be considered a proxy for the how much of the sediment comes from the land. The proxies tell us which species of plankton dominated the region in a particular period: if the sediment is dominated by species which live in open water then they can infer that the polynya existed and so the Mertz Glacier had a long tongue extending north. If the sediment is dominated by species which live in the sea ice, then the polynya and the glacier tongue were absent. It is quite an elegant way to investigate glacier flow. 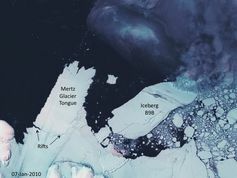 A massive iceberg (right) drifts slowly towards the Mertz tongue. 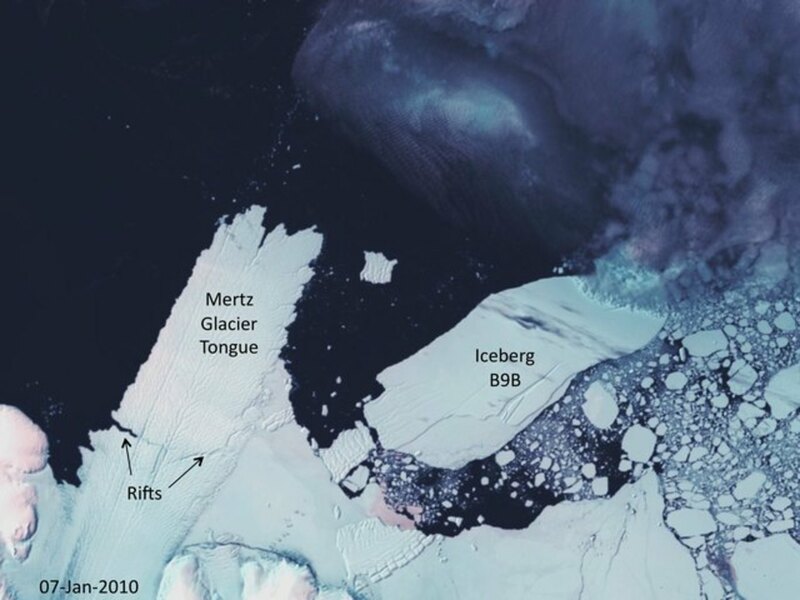 What they found is that every 70 or so years the Mertz polynya is absent for tens of years. Given that the glacier is advancing about 1 km per year this means a super-iceberg tens of kilometres in length has regularly formed in this region. These days we can see this happen in almost real time through the amazing access we have to satellite imagery and in February 2010 an iceberg containing almost 900 billion tonnes of fresh water broke free. 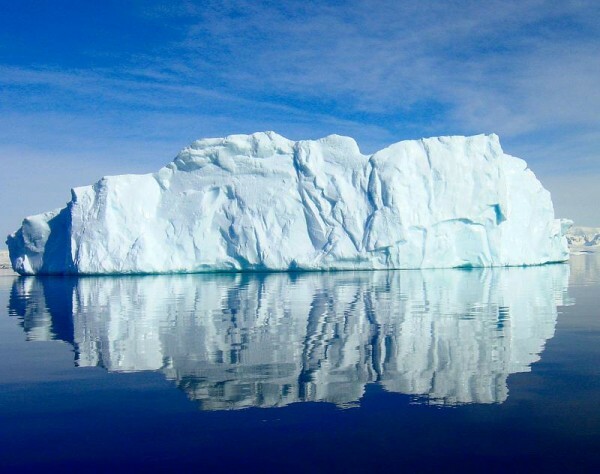 You may think it would drift north, away from the continent, but icebergs this big don’t have an easy path. They crash and bounce along any relatively shallow region of the sea floor and wipe out anything in their way. Most people know trawling harms the sea floor; imagine the trail of damage 900 billion tonnes of ice scraping on the sea floor can leave. 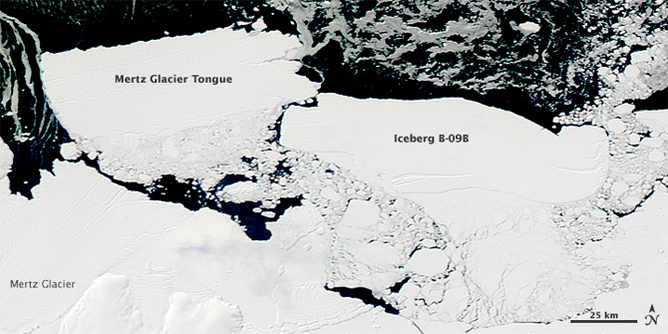 B09B collides with the Mertz Glacier Tongue, causing it to break off and form a new iceberg. Very large icebergs get identifying codes; this one became C28 as it was the 28th large iceberg from this sector of Antarctica. It took two months for C28 to reach the deep water before it shattered into two pieces (C28A and C28B since you ask) both still massive, and both went on to spawn further icebergs as they fractured into ever smaller pieces over the next few years. 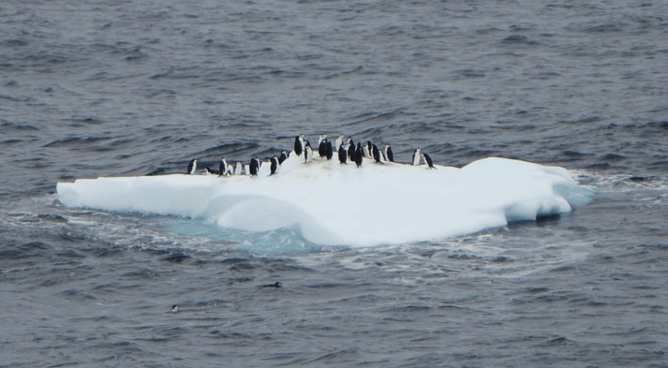 When still close to shore these giant bergs are bad news for penguins, who suddenly have to travel much further – around the iceberg – to find open sea, and their food. Chicks growing up near a massive iceberg may starve and die and some entire colonies may become unviable. Penguins can make bad life choices too. As they drift away these huge icebergs create their own habitat cooling the seas and freshening the waters, and also seeding the oceans with iron which means more algae and plankton at the bottom of the food chain in remote locations such as South Georgia, where icebergs run aground and die. Over the past 50 or so years the robust cycle of growth and decay in the Mertz glacier has broken down. The researchers think this is due to large-scale changes in the way the wind circulates over Antarctica – the so-called Southern Annular Mode (SAM). Other studies have shown us that the way the SAM has changed over recent decades has an anthropogenic footprint. It seems even in Antarctica we can identify human impacts on climate processes that are likely to have been operating for thousands of years.